Beautiful weekend weather has been drawing us to our balcony. 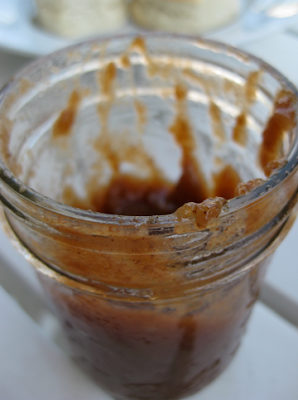 Here is our breakfast from the other morning - featuring the post recipe - Apple Butter. This is a cooking light recipe recommended by my dear friend Beth who understands the importance of enjoying all things savory! 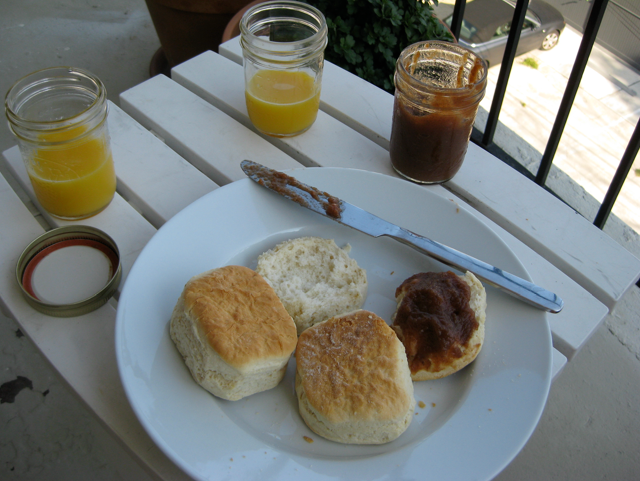 Homemade Biscuits and Apple Butter! The perfect outdoor breakfast! This step recommending by Cooking Light takes too long for a casual cook like me, so I suggest skipping it: Place a large fine-mesh sieve over a bowl; spoon one-third of apple mixture into sieve. Press mixture through sieve using the back of a spoon or ladle. Discard pulp. Repeat procedure with remaining apple mixture. INSTEAD: Spoon mixture into a food processor - I used my Cuisinart mini-prep - to puree. Return apple mixture to slow cooker. Cook, uncovered, on high 1 1/2 hours or until mixture is thick, stirring occasionally. Spoon into a bowl; cover and chill up to a week.